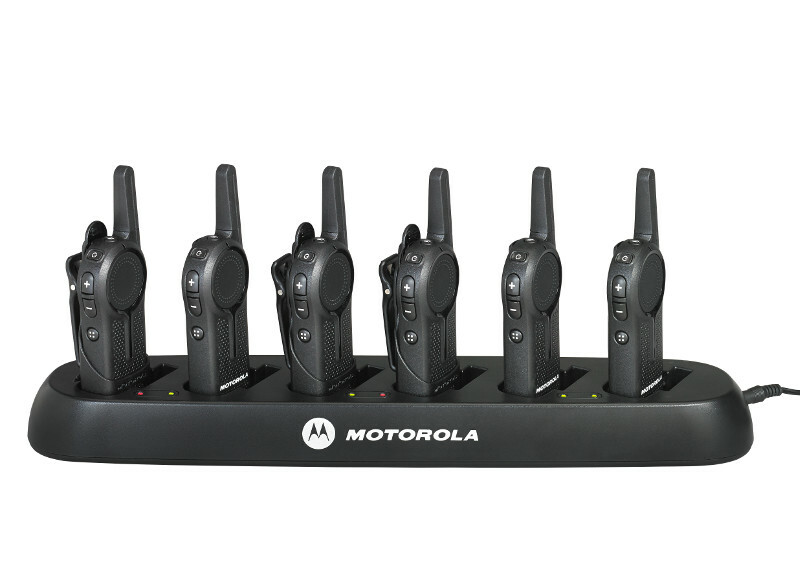 This combo pack of five Motorola DLR1060 two way radio walkie talkies offers an affordable solution to outfit your entire team. The DLR1060 walkie talkies in this two way radio bundle are extremely compact and lightweight while also offering crystal clear digital technology and great battery life. The DLR1060 radios in this two way radio 6 pack are full of incredible features and benefits. For example, the digital technology of the DLR1060 make it license-free and allow for one-to-one communication while eliminating static and interference. This DLR1060 two way radio package is a great choice for any restaurant, retailer, church, school, or other small and mid-size businesses. The Motorola DLR1020 is a 1-watt, 2-channel digital two way radio with a battery life of up to 14 hours! Check out the "Technical Specs" tab above for more helpful specifications and features! -1- 56531 6-Bank Charger - charge up to 6 radios at one time! Looking for Other DLR1060 Radio Bundles? Look Below! If you are looking for other bundle quantities of DLR1060 two way radios, check out the links to other DLR1060 combo packs below!